Herbie’s top of the range package includes two venue runs perhaps to take the groom and best man to the venue or bridesmaids, ushers, parents or even friends and family members who want to experience Herbie, then he will return to collect the bride but whatever your requirements please ask as Herbie wants to ensure your day runs without a hitch! 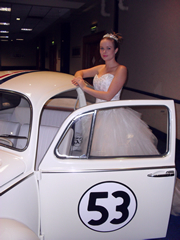 Then when everybody has the pictures they want and you are safely inside your venue Herbie will discretely drive away if that possible for our little bug! Whatever you need or want of Herbie please just ask one of his caring owners who will ensure they do every thing they can for your time with Herbie. It’s your special day and Herbie is excited to be part of it so please do not hesitate to ask.